As a result of continued research into device protection technologies, Apple has developed an automated bumper system that doubles as a floatation device, protecting iPhones from drops and large bodies of water. 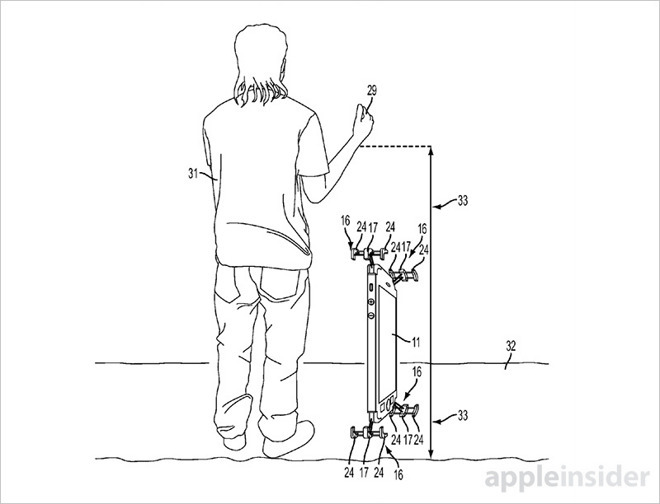 Published by the U.S. Patent and Trademark Office on Thursday, Apple's application for an "Electronic device housing" details an iPhone security system that automatically deploys protective shock absorbers when onboard sensors detect a potential impact. The claims are similar those offered in a separate Apple invention revealed last month describing an automated screen protector, but employ cushions made from a buoyant material instead of retractable tabs. Apple first makes contingencies for drops on hard surfaces. Onboard sensors, including accelerometers, gyroscopes, cameras, microphones (in conjunction with a speaker for echolocation) and more, are configured to monitor device motion for changes in velocity, acceleration and other movement characteristic of a drop event. When a free fall is detected, the system triggers spring loaded shock absorbers that shoot out from the device housing. Depending on the implementation, bumper cushions made of foam, plastic, rubber or other suitable material are integrated with the shock absorber mechanism to slide out on specialized support rods. These cushions can also be replaced after a drop or deterioration, a particularly useful feature if the system is designed to disperse kinetic energy by failing. Because they are buoyant, the bumper cushions also serve as a precautionary measure against accidents involving water or other liquids. Users have been known to drop their iPhone in pools, puddles and even toilets. In some cases retrieval is difficult or impossible, as iPhones can quickly sink to unreachable depths or go missing in murky shallows. As many iPhone and iPad owners know, recovering and repairing a water-damaged device is usually less costly than replacing it. Strategically placed at an iPhone's four corners, or along its display edges, Apple's cushion system and accompanying support structures effectively act as water wings. 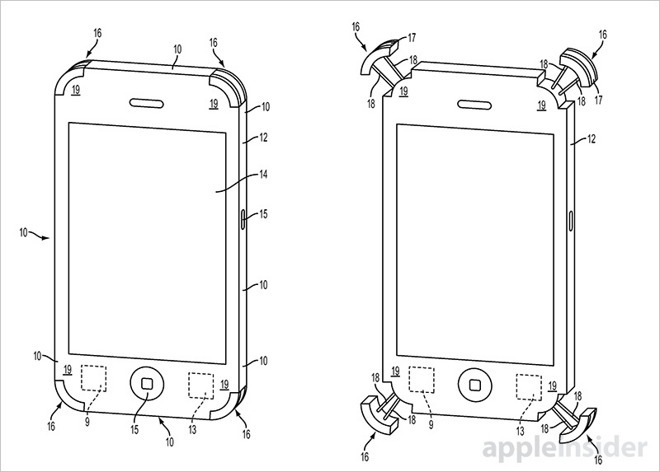 The document points out that an iPhone might be able to float above a liquid's surface, though such a scenario would require a perfect combination of bumper support structure extension, positive inherent buoyancy and device orientation. It should be noted that the shock absorber system does not need to deploy in order to function as a float. Considering current iOS device design, Apple is unlikely to implement its shock absorber/floatie invention anytime soon. A more sensible approach might be the inclusion of buoyant chassis materials, or sealing internal cavities to displace external fluid, but costs associated with such designs are likely prohibitive. Apple's iPhone floatie patent application was first filed for in May 2014 and credits Minhyung (Kevin) Moon as its inventor.